Volcanic eruptions are among the most important natural causes of climate change, playing a leading role over the past millennium. Injections of sulfate aerosols into the lower stratosphere reduce the incoming solar radiation, in turn cooling the surface. As a natural external forcing to the Earth’s climate system, the impact of volcanic aerosols on the climate has been of great concern to the scientific society and the public. In recent years, scientists have found that there is a relationship between volcanic eruptions and the El Niño-Southern Oscillation (ENSO) based on reconstructions and model simulations, which is manifested in increased/decreased sea surface temperature (SST) gradient over the equatorial Pacific. 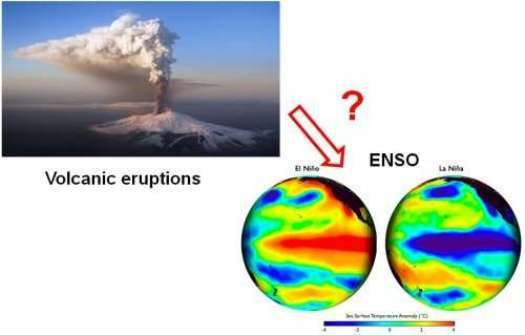 Since ENSO influences the global climate through atmospheric teleconnections, it is of great importance to understand the influence of volcanic eruptions on ENSO phase changes. Many studies have shown the phenomenon, but the reasons remain ambiguous. Recently, Zuo Meng, a doctoral student from the Institute of Atmospheric Physics, Chinese Academy of Sciences, along with her mentors Prof. Zhou Tianjun and associate Prof. Man Wenmin, used the CESM Last Millennium Ensemble (LME) simulations, which has the largest ensemble of LM simulations, to investigate the impacts of northern, tropical and southern volcanic eruptions on the tropical Pacific SST. Analysis of the simulations indicates that the Pacific features a significant El Niño-like warm SST anomaly five to 10 months after northern and tropical eruptions, with the Niño3 index peaks at the winter of next year. Compared with northern eruptions, the warm SST anomaly is mainly confined to the eastern Pacific with a stronger intensity following tropical eruptions. Following southern eruptions, the Pacific shows a weaker warming anomaly over the eastern Pacific, and the time at which the Niño3 index reaches its peak is about four months earlier than that after northern and tropical eruptions. They further advance the underlying mechanism: The shift of the intertropical convergence zone (ITCZ) can explain the El Niño-like response to northern eruptions, which is not applicable for tropical or southern eruptions. Instead, the westerly anomaly in the western Pacific triggered by the ocean dynamical thermostat mechanism can explain the divergent SST responses following three types of eruptions.